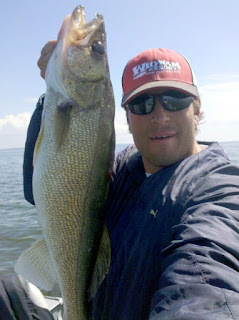 Welcome to another edition of the Wigwam Fishermans Blog. Today as I opened the door to walk outside I was met with a great gust of wind, which sent a chill down my spine. This is the first time that I can remember this summer that the temperature has really dropped to fall type temps. I believe the weathermen/women are predicting cool temps and gusty winds for the next few days, but then we should be heating up again into the mid 70s as we head into the weekend. Even with the fluctuation in temps, the fishing has still been better than any other lake in our great state of Minnesota, or even, if I might be so bold, the United States. Yesterday after church, Jody, I and Vancouver took the afternoon to do some more blueberry picking, and they are still out in full force. I cant ever remember picking blueberries in early August, but you wont here me complaining, I love the blueberries! I know Im anticipating this a little bit, but I cant wait for Jody to whip up some of her famous blueberry crisp, pancakes, pie, shakes, and more blueberry surprises than you can shake a stick at. I know that Im very lucky and not everyone will get to experience what I get to experience. But you must know that there is plenty more to do up here in Gods country than just catch fish. If any of you ever want to know where the blueberries are, or anything, please dont hesitate to ask, I love to help people out, regardless if its on the lake or not. This past weekend I was able to get out there and do a little bit of fishing before the winds started to pick up to the point where there at right now (very gusty), and the fishing was still top shelf. Thats right guys and gals, right where grandma keeps the peanut butter, thats some old hockey terminology for all you none hockey fans out there. I was out with Vancouver lead coring with TDD-7 & 9s around the edges of the North Bridges Reef and was picking up some big fish. 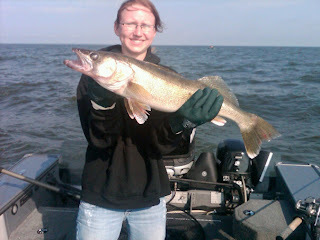 The biggest was the 28-1/2 Walleye that I have pictured here. The colors of the Walleyes have just been beautiful this year; the way they just glisten in the sun is absolutely breath taking. As I have indicated on many different occasions, Lake of the Woods is so healthy this year. With the 3 fish fly hatches weve had and the speculation from the DNR, which stated that this last spawn was one of the best theyve had in a decade. 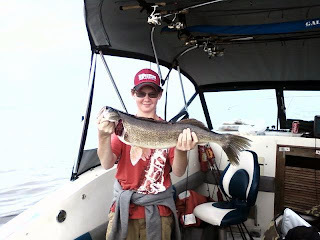 The Walleye populations will be on the rise and we dont see any end to the fantastic fishing weve been having, really all year long. 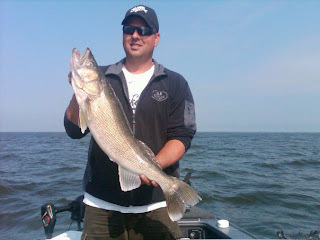 This should make every angler salivate at the mouth, and Ill look forward to hearing from you about booking your next fishing adventure to Lake of the Woods, the Walleye Capitol of the World. My shout out today will go out to Beau Seeger, a guest that we had stay with us last week. Beau sent me a great e-mail, which Id like to share with everyone today. Thanks a ton for the photo. The little guys were super impressed that the resort manager and guide who put them on the spot took their picture. The next day (Friday) we packed up to leave and decided to go out for a couple hours late morning to the spot we'd hammered fish the night before. Luckily we had time for one big hour and a half drift before the wind died down and caught some nice fish. I sank into a "log" at the end of the drift and my 7 year old, Rhett, asked me if he could reel it in. I knew it was a pig right away because there was that big exaggerated left to right and back again of a walleye that is pushing 26" or more. I handed Rhett the rod and had him put his top hand higher than normal and watched. 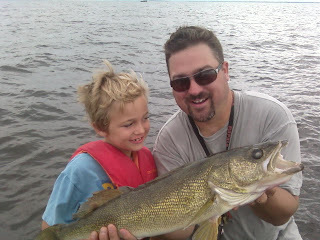 10 - 15 minutes later we scooped up a fat 28 walleye and Rhett was shaking from excitement and arm exhaustion. One quick photo on my crappy camera phone (see attached), a lot of high five for the little guys, and then we pumped her for about three minutes before she took off back into the depths of the mud flats. All three boys were jacked that we got a big one and we could put her back so that we can come back and do it again someday. Both cousins got a 22" eye the day before, so they were happy too and one also lost what I guessed was a 25"+ Eye but we called a Sturgeon because he really wanted one of those prehistoric monsters. Thanks a bunch for catering to our last minute decision to come up for a couple days on a bargain deal (I'll keep watching the blog). Thanks to everyone up there that we spoke with at the Wigwam who were so nice and accommodating. This is exactly why men, women, and children come to Lake of the Woods, and the Wigwam Resort. I hope to see you guys back here again very soon, but regardless of that, this is why we do what we do, to make sure that people have a great time, and thank you guys for giving us the opportunity to have you and your family as our guests at the Wigwam Resort on Lake of the Woods.